"The Most Dangerous Game" or "The Hounds of Zaroff" (1924) is a short story by Richard Connell. 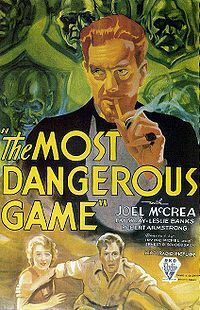 Widely anthologized, and the author's best-known work, "The Most Dangerous Game" features as its main character a big-game hunter from New York, who becomes shipwrecked on an isolated island in the Caribbean, and is hunted by a Russian aristocrat. The story is about a sardonic and ironic gothic inversion of the big-game hunting safaris in Africa and South America that were fashionable among wealthy Americans in the 1920s. At the start of the story, Sanger Rainsford is steaming south to Brazil to hunt jaguars in the Amazon with a fellow hunter named Whitney. Rainsford is presented as stereotypically heartless hunter, unconcerned about the life or feelings of his prey. As they pass through the Caribbean, Rainsford accidentally falls over the side of the yacht, but saves himself by swimming to the rocky shore of a mysterious island. Moving inland he discovers a large manor-house on a cliff. He knocks at the door and is welcomed by General Zaroff, a gentle and elegant man of noble Cossack heritage who apparently lives on the island alone with his powerful servant, a terrifying deaf-mute named Ivan. Zaroff explains that he is the ultimate big-game hunter; he lives for his hobby, and has traveled the world and hunted every possible game animal. Now he has become so good at it that he's bored with his beloved pastime. In search of the only prey that can make the hunt challenging, he has begun to hunt humans. He lives in luxurious seclusion on the island, tricking ships into wrecking near his island with misleading navigation lights. When the surviving crew swim to his shores, he offers them a choice: they can be murdered by Ivan or choose to be hunted on the island by Zaroff. If they survive three days, he promises to set them free. Rainsford professes horror at the hunting of humans, and it isn't long before this hunter must himself be hunted. Zaroff offers Rainsford the same choice: become prey, or die. Rainsford must set out to survive his three days as a game animal with only a sack of food and a knife. The conclusion of the story focuses on what happens when these two skilled hunters finally match wits. Sanger Rainsford, an accomplished hunter from New York. General Zaroff, a man of pre-Revolutionary Russian aristocratic background. Utterly fixated on hunting. Ivan, Zaroff's large Cossack slave and bodyguard. He is deaf and has no tongue. This makes him ideal to Zaroff as it is impossible for Ivan to tell anyone of General Zaroff's murders if he escapes the island. Whitney, one of Rainsford's boatmates who appears briefly in the introduction, wondering what it would be like if he was the hunted instead of hunter. This page was last modified on 14 January 2018, at 23:27.